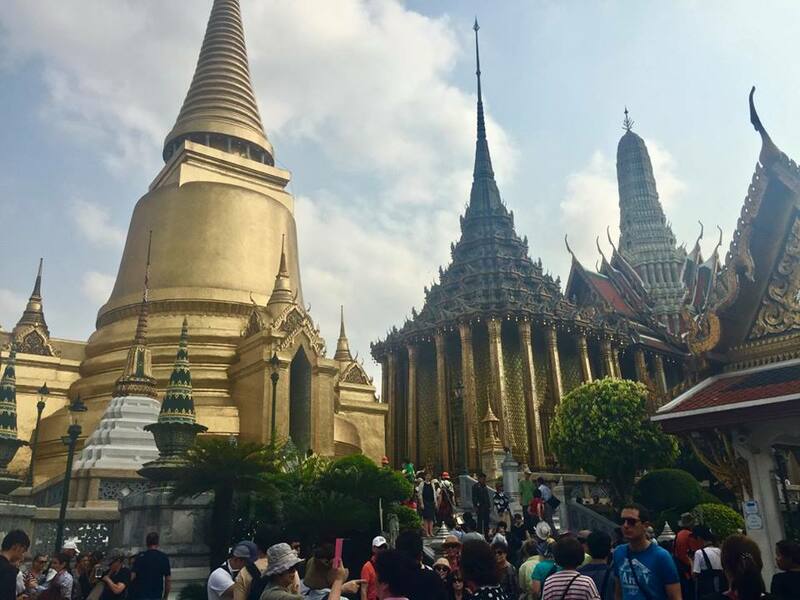 In the heart of the compound, we enter Wat Phra Kaew, otherwise known as the Temple of the Golden Buddha, where we see the tiny, 31-inch emerald Buddha sitting up on a tower, which only the King is allowed to touch three times a year. This particular figure, which is difficult to even see from the floor, is the country’s most revered idol. 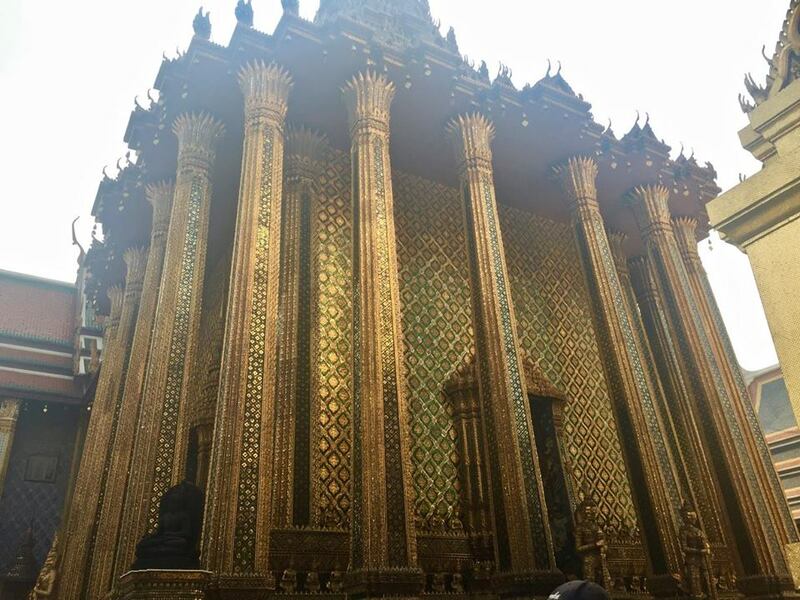 After we see the Grand Palace, we get on a long-tailed motor boat and zip along the River of the King, swaying back in the forth in the narrow boat and praying we don’t tip over into the murky water which is guaranteed to grow you a sixth toe. 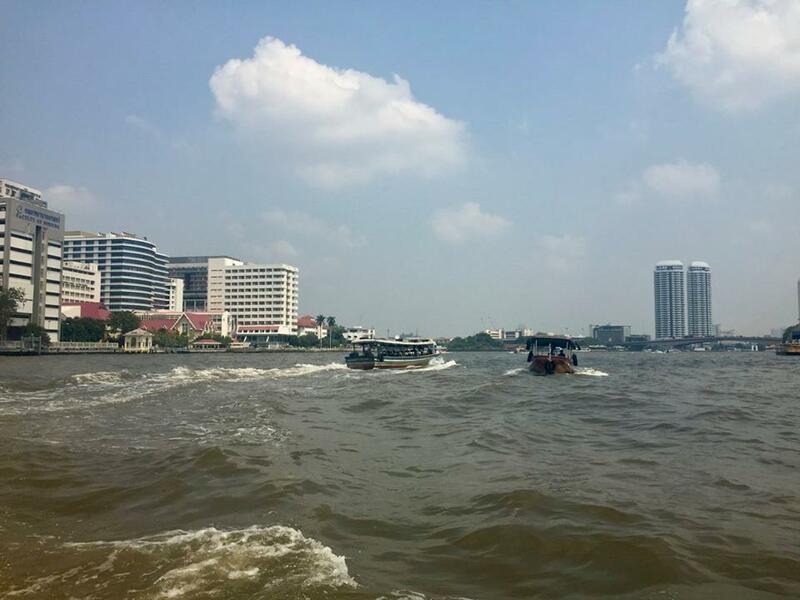 The ride definitely isn’t relaxing like I thought it would be, but it’s cool to see homes on stilts, Thai people using the river and seeing the city from this angle. That night, Mike and I have the intention to see the Chinatown Flower Market, otherwise known as Pak Khlong Talat, which I stupidly imagined to be a very romantic and relaxing trip. The second we arrive in Chinatown, I realize that this is a totally ridiculous assumption. I have been to the Chinatowns in San Francisco and New York City, but this one takes the cake – it is complete pandemonium on a Saturday night, full of flashing lights, lawlessness traffic and street food carts lined up one next to the other selling pig snouts, whole ducks, sticky rice, fried wontons and everything else you can imagine. Grime sticks to the dark streets, alleyways are overrun with carts and garbage, rats and stray cats run amok but yet no one seems to care as they sip their noodles or chomp on some street meat, practically on top of one another at the plastic tables set up in any free space. Despite the wealth of Chinese food, the streets smell overwhelmingly of garbage, they make no sense they are full of stray animals, rats, homeless people and dilapidated buildings. The only way to even cope with it is with Changs, which is when we realize that Brandon and Heidi are not your average Southern married couple. Brandon, who is at least six-feet-tall, towers over the streets full of Thai people and stands out from the sea of black hair with his booming Florida drawl and blonde hair. 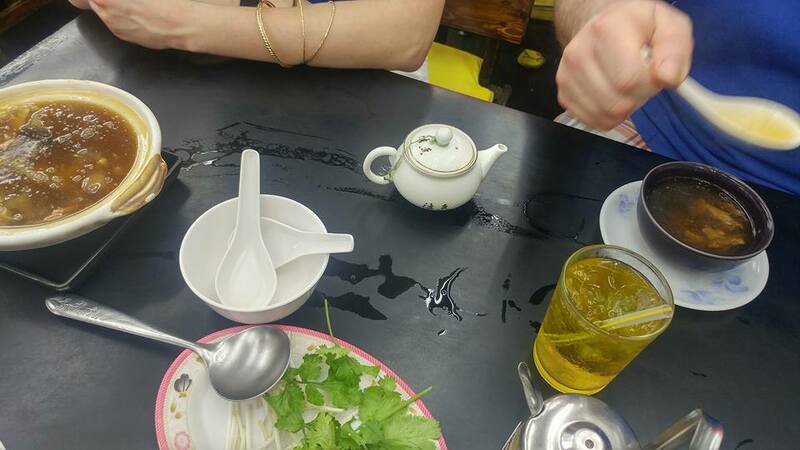 He has no fear, volunteering to ask all of our tourist questions and eagerly trying the disgusting shark fin soup and birds’ nest soup, which are expensive delicacies in Chinese restaurants in the States. Brandon and Mike slurp it down when we sit at one of the Chinese eateries. Even though the birds’ nest soup is made from created by edible-nest swiftlets using solidified saliva and the shark fin soup is made with actual shark fins, plus I’m not feeling too hot after a day in the sun, I try both since I figure I write about food for a living and probably should. They are just as disgusting as I imagined them to be. The birds’ nest soup tastes like a cottage cheese-esque chicken soup and I don’t think the shark fin is quite as bad, with a darker color and fishy taste, but they are both truly gross. I opt for a sticky rice with mango to help settle my stomach. We then go and try to find the flower market, but a Thai man stops us to tell us that the market is closed tonight due to a holy holiday and we should take his tuk-tuk to a nearby place to see fireworks instead. We’re not sure if we should keep trying to find the flower market at this point, but we can’t even figure out where it is, so I say forget it and we can try again another day. Later, I realize what an obvious scam this way – the flower market had definitely been open. Brandon and Heidi haven’t been on a tuk-tuk yet so we take one home, but unfortunately they are made for two small people, not three small people plus one six-foot-tall man, so I sit on the floor of the tuk-tuk and pray for the best as our non-English speaking driver stops other drivers to try and determine where our hotel is. It’s not looking good. At this point, I don’t even care that we didn’t see the flower market. 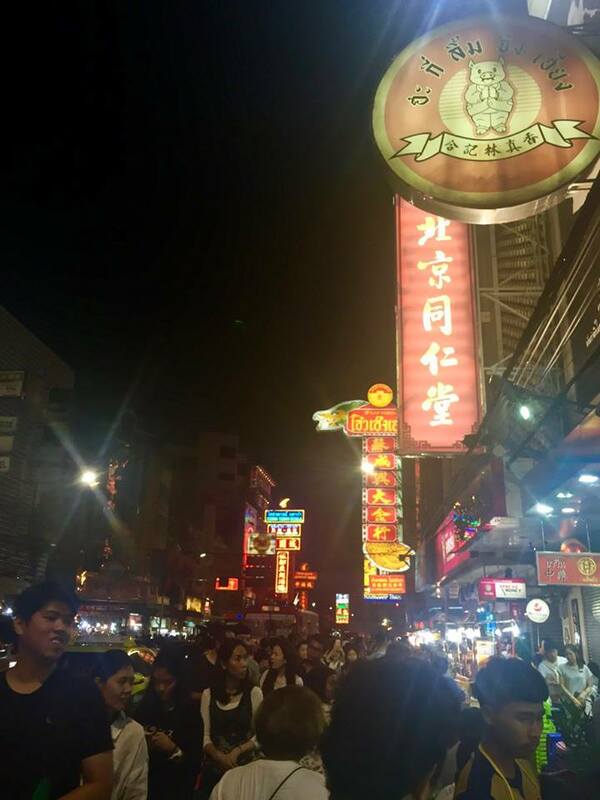 I can’t imagine how it could ever function in the mess that is Bangkok’s Chinatown anyway.